In our final 5-part course, learn how to activate your creative interventions and amplify your change-making projects out into the world, get over procrastination, and achieve greater reach and impact with these examples and tools. Designed for those who are ready to move from learner to doer, this course will help you define and build the resilience and capacity you need to be an activated changemaker, leveraging tangible, real-world interventions for positive change. You'll learn ways to get your ideas out into the the world, from the practical steps of project planning through to the more conceptual frameworks that help to contextualize the concepts of activation. The course will guide you in considering how projects and activations may evolve and will help you to develop contingency plans that allow for flexible, rapid adaptation. You'll learn to establish benchmarks and iterative design changes to build stronger, more robust outcomes, and to set up feedback loops that will help make your future interventions more impactful. Riding on your understanding of systems thinking*, this course equips you to unpack the ways that projects respond to dynamically evolving systems, so that you can get your projects activated and amplified in the dynamic evolving systems at play. Refine thorough, deep thinking on amplification and modes of activation. Understand ways you and your projects can respond to dynamically evolving systems by creating contingency plans. Confidently communicate and activate your personalized changemaking practice, as well as evaluate it for evolution opportunities. 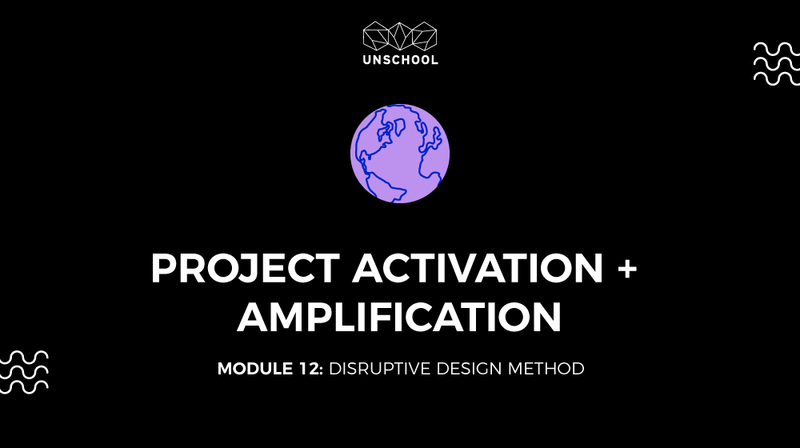 Video: What is project activation & amplification? Project Activation & Amplification Course Synthesis - Tying It All Together! This knowledge session is all about implementing, activating, and amplifying ideas out into the world. Ideas stuck in your head are pointless for changing the world. In this final stage, we need to start to activate our interventions and set up the feedback loops that will give us the resilience to make our future interventions even more impactful! In this class, we will explore ways of getting your ideas out into the the world, from the practical steps of project planning through to the more conceptual frameworks that help to contextualize the concepts of activation. We will consider how they may evolve and develop contingency plans that allow for flexible, rapid adaptation, and you will establish benchmarks and iterative design changes to build stronger, more robust outcomes. We look into ways that projects respond to dynamically evolving systems so that we can get them activated and amplified out into the dynamic evolving systems at play. This session will help you define and build the resilience and capacity you need to be an activated changemaking with tangible, real-world solutions with positive effects!